Equipped with SATA III, FE2013 works with your 2.5 inch SATA HDD/SSD. The external hard drive can be connected with your computer like a portable hard drive. 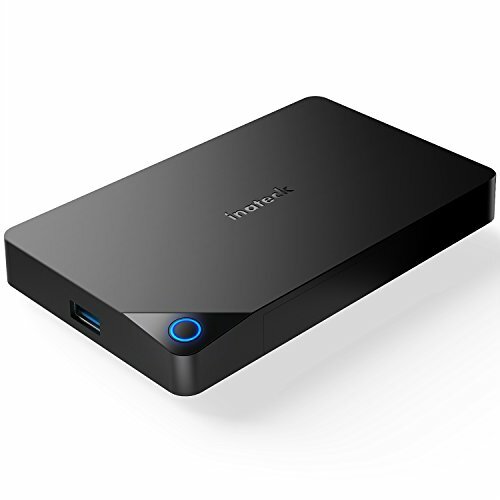 It can also be connected with smart TV, as well as devices with USB port. The enclosure uses the high-end ASM1153E chip, and is compatible with Windows 2000/98/XP/Vista/7/8/10, Linux, Mac OS9.1/10.8.4 and above. There's no need to worry about compatibility issues between the enclosure and your OS. A SATA III port is installed inside the enclosure, with a bandwidth of 6 Gbps, backward compatible with SATA I, SATA II. With UASP supported, the FE2013 can transfer data at a speed faster than a traditional USB 3.0 port. UASP compatible. USB-A port is installed, which is easier to plug and unplug, more durable than a Micro B port and, backward compatible with USB 2.0. Comes with a USB A 3.0 to USB A 3.0 cable (50cm). High-speed Transfer: SATA III is available with a bandwidth of 6 Gbps and it’s backward compatible with SATA I and SATA II. UASP supported, to ensure high-speed transfer. Smart Functions: Starts sleep mode automatically after lying idle for 30 minutes, with an LED indicator entering breathing mode. This reduces unnecessary power draw, lengthens the hard drive’s life. Unique Design: Ring-shaped indicator complements the unique design, which adds a sense of science to the enclosure, aesthetic in look and convenient in use. If you have any questions about this product by Inateck, contact us by completing and submitting the form below. If you are looking for a specif part number, please include it with your message.